You can watch the video for the past episode recorded on February 07, 2019 above, or you can review the transcript below. Hey everybody, welcome to episode number 69 of the Real World Productivity Q&A we’ll go with that today. Now happy to have you here. We’re going to cover a couple of really good questions have one about little bit of things you can do to optimize flight time when you’re traveling as well as what you can do, kind of leading into your weekend to kind of maximize that and I’ve got a couple different ways of looking at that that we’re going to get into that can not only save you some time, but also I feel kind of clear up some stuff in your head as well as make you kind of happier and enjoying that time more which I think for myself is important, whether it’s the weekend whether it’s an evening it’s a day off, it’s whatever it is. So before we get into that though, just wanted to say if you’re watching live, that’s great. Feel free to ask questions. I’ll be checking those out, off and on as we go. If you’re not watching live, that’s okay too. That means you’re watching properly on YouTube. You can always come join us the check out the description, you can come join the group, it’s a free productivity group on Facebook, you do have to answer a couple questions to get in want to make sure that you’re interested in productivity, time management, automation, all that sort of good stuff. Also, if you want to stay up to date and get notifications about this, as well as reviews, updates about apps, all sorts of stuff. Actually, I just uploaded one to the channel shortly earlier today. I believe it went live for a really cool tool that I checked out called reboot.cc. But anyways, you want to stay up to date on that sort of stuff, you can click subscribe and stay up to date on the channel. So that said, let’s get into it. So the very first question was, what are some during the flight airplane hacks? Okay, so I’ve got mine and I think the first one will be kind of obvious, but I have want to go into why so you probably heard or seen or you maybe hopefully already own a pair of these noise cancelling headphones, which I understood a long time ago, like yes, it’s they can do it. There’s science behind it. I believe it I just didn’t believe that it was going to be worth it. And so I never bought a pair you know, they’re always seemed like how do I want to spend the money on this? It just doesn’t seem like you know, what’s the payoff? And so for Christmas one sounds like yeah, you know what, I keep hearing that these are actually really good, especially when traveling so, you know, I’ll see if, you know, someone wants to pick those up for me because I don’t want to spend the money on them. So, you know, did that, got them and wore them and they were amazing and I kicked myself for not doing it years ago that for me, totally transformed it. Okay, I’m not gonna lie. It didn’t make flights like more comfortable doesn’t make the seats bigger, but it really does block out the noise really brings it down and for myself, you know, getting off of flight. Sometimes I just feel like kind of foggy or a little bit of a headache and I think that was just from the noise levels and being able to put on these noise cancelling headphones for several hours and walking off the plane, I honestly can feel a physical difference. And then that obviously helps kind of mentally like, I don’t feel as fatigue getting off the flight. So for me, I would say it’s worth it. Obviously, you know, if you can grab a pair, there’s many brands out there, they vary widely just read reviews. And I would imagine get a pair that has good reviews is probably the way to go with that. But yeah, that for me was the biggest change barring that if you don’t want to, for whatever reason, you don’t want to get those, you know, maybe wearing earplugs or you know, that type of a headphone but I will say you know, it’s tough if you have phones sorry, headphones that don’t block some of the noise then you’re really just going to be like double blasting your head with really loud music which one isn’t that great for you and to might even, you know, give you a headache and make it worse. So that’s mine. I really enjoy that and then it leads into this other stuff that it makes me more productive because I’m more relaxed I feel better you know, I can block out stuff that people around me you know, it’s not bugging me as much so I’m able to concentrate on whatever it is I’m doing, whether it’s, you know, being, you know, write down some notes or watching a movie or whatever it is. So Secondly, you know, if you want to be more productive on the flight, I think you really need to be realistic about this. Okay, I would say choose the easy to do things, okay, when maybe it’s, for me, it’s a good time to kind of learning or getting things out of my head. So I’ll go kind of two paths with that and say that, you know, consuming media is really easy for me when I’m on the flight I’ve got my headphones on. So obviously listening to things as easy listening to a podcast catching up on an audio book, I find that those are good and you need to obviously have that stuff ready to go beforehand, or it makes it much easier especially then if you’re going to watch a video you know, you probably need to have that downloaded ahead of time. So I find that that’s really the best use of my time. I would say that as far as writing I know some people that is totally up to you. If you can fit in the seat, you know, even if it’s business first class, wherever you’re at, it’s tough for me to do that. And so I’ll do it if I really need to. But it’s generally just to like, get something out of my head quickly. It’s uncomfortable for me to try to use a normal laptop. So what I’ll use sometimes as I’ve done like no cards, if I’m going over like a talk or just some points maybe for presentation or something that that’s more for me, I feel comfortable I can kind of you know, do it on the little table in my seat. Other than that, I would say that this one is good This may not help your productivity but it can make your flight a lot better. And my wife introduced this to me she started bringing stuff for the flight attendants and you know expecting nothing in return just saying you know, hey you know we grabbed you a little box of chocolates you know, we appreciate what you guys do. We know you probably have kind of a thankless task sometimes and deal with some really crappy people and just saying thanks and you know that they’re honestly most of the time, they’re just really happy. Like, oh, you know, we appreciate you taking the time to say that, Who wouldn’t? And, you know, sometimes they’ve been, you know, nice and given us something to eat, or something like that. But if you go into it, you know, generally with the idea of, Hey, I expect nothing, I just kind of want to say thanks and make this better, you know, then I it’s kind of a win win, you’re probably going to make somebody’s day and they might do something nice for you, or you, you know, you just did something nice. And, you know, hopefully you can be just with that. Alright, so those are the big ones for me as far as being kind of optimizing time on a flight. And I think that that really is important to be realistic with yourself about how much you’re going to get done. I tend to just think of like, bigger ideas of like, I’m going to listen or like listen to an audio book. That’s kind of like my goal. And then it’s much easier instead of being like specific tasks, like I’m going to go through and edit all this stuff and do this and that I find that that stuff falls apart really quickly for me, so all right. Second question today was a, let me pull that up. What What is the most productive thing you do for an hour before you start your weekend? Well, I would say it’s not always an hour. But the most productive thing I do before starting my weekend, it could be kind of a, and I’m going to generalize this, this is a good daily thing if you’re kind of shutting down, or if you’re taking a day off, or you’re going on vacation. But a lot of it starts maybe. And again, just go back to the weekend analogy is ending on Friday. And so kind of closing down that day and making sure that you’re closing off those loops and saying, Is there anything else I need to do? And then let’s, you know, that’s pretty straightforward, I think. And then waking up let’s say on Saturday, and you wake up and you get around and you have a cup of coffee and you’re sitting down if the weekend what do you do? And I would say, Yeah, I don’t need an hour to do this. But I would kind of do the same thing where you’re highly encourage you to do a daily review every single day. All right. 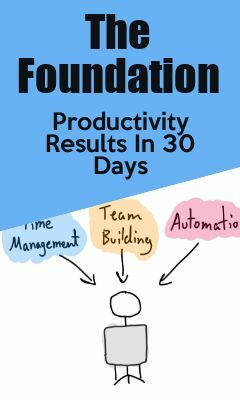 That’s really part of the founding of building up your productivity and becoming more efficient so that you can spend time doing the things that you most want to do. So do the daily review. And part of that should include, hey, it’s the weekend, what do I want to do now? I got nothing wrong. And I think it’s good to have time where, you know, what am I going to do be freaking lazy. I’m gonna watch Netflix today. That’s totally fine. But I think also, a lot of times, we let things get away from us. And you know, we had all these things we wanted to do. But you know it we either forgot we didn’t get to it, because we ended up taking the whole weekend and watching Netflix or doing something. So write down, you know, what is it that you actually want to do again, you know, maybe being realistic with this is always good, but for example, want to go on a hike, right? That’s one thing. I want to go on a four or five mile hike. You know, I’ve been talking about going to that bookstore, I’m going to go there. There’s a new restaurant and we’re going to go eat there on Sunday afternoon. All right. And for me it this stuff doesn’t have to be complicated. It’s not as for me detailed as like a normal daily plan and saying, okay, here’s the tasks and patching and priorities, but just getting those things out, what is it that I want to do? And I find that this will make your weekends kind of, like, happier, I guess Is it is it but as far as like, are, you know, are you happy? Are you content with what you’re doing? And just reaching these little internal goals of doing more things that you want to do, which again, for me is like, is the goal for this stuff? It’s not about like, Oh, look, I accomplished 10 things. Who cares? I don’t I want to accomplish the one thing that I want to do. And so like for me that this weekend, it’s going for a trail run. So I make sure that that’s what I do. I get out and that’s the first thing I do because I love doing it. I want to do it and it’s good for me. So I go do it. And after that, I’ll actually come down and do my little weekend review and say, Okay, then I gotta pick up the place. You know, we’ve got a few odds and ends we need to take care of her on the house. And then actually, there is a bookstore I want to go to. So that’s one thing I’m going to do and literally just writing it down on a post it note using the best self journal, whatever it is used for tracking and then you can have that as a quick reference be like, Oh, that’s right, you know, I’m kind of bored, what was it, I wanted to do go to it and get that stuff done. So I think that that really improve anyone’s happiness and just help you stay on top of things in such a good way it to me it’s been a real positive boost to getting things done, and really enjoying myself more with my time off. So I will say that, you know, like anything, you just can be taken too far. And hopefully I’ve kind of hedged enough to say like you know I’m okay with having time where I don’t have this like structured time and I don’t I don’t advise anyone to take this so far that you’re you know you have to plan out every minute so a lot of times that won’t work especially for relationships you got to have time you know for to allow for other person doing things are having their plans to do and that gets into communication which is a whole nother topic but I would say that, you know, just having these ideas and getting them out of your head about what you truly want to do is the most important part. So hopefully that’s uh. That’s helpful right I’m gonna wrap this up. I think I don’t see any more questions let me check over here real quick. All right, I think that’ll do it for this week. So once again, if you ever have questions and you’re watching live, you can just put it on the page and the Facebook group. If you’re not watching live, you can come join us link is in the description and you can ask questions there. Of course you can also go to productivity dot Academy slash questions and ask there and I’ll answer them as time allows during the q&a. So thanks for watching. I’ll see you next week.